Birchmere Owner Jimmy Matthews calls for a holistic look at the 45-acre Arlandria neighborhood. He envisions his storied music hall as part of a sustainable urban community. One where people walk, take transit, or drive to arrive at his doorstep; where there is the palpable buzz of "Shirlington meets Adams Morgan". 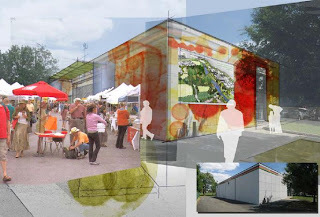 He envisions a diverse, mixed-income community where people live, work, and play close to home. But he fears that one of the 4 large landowners in Arlandria will tire of the obstacles in Alexandria's Planning and Zoning and redevelop in isolation -- forever ending any opportunity to build a vibrant community across the whole neighborhood. Mr. Matthews worries that if the City doesn't lead, follow, or get out of the way, one of the most underdeveloped and potentially valuable communities adjacent to DC will be disjointed and will never reach its potential. Last Wednesday night saw the City's first Arlandria Action Plan Implementation Group (AG) meeting (agenda). There were at least 30 people in attendance, nearly all of whom seemed to want to see something accomplished... a rarity in Alexandria. While mainly an introductory meeting, City staff reviewed the beginnings of some exciting changes, starting with the redesigns of the intersections where Mount Vernon Avenue meets West Glebe Road and Reed Avenue and the results of a sophisticated pro-bono architectural brainstorming session on the Four Mile Run Park Expansion. 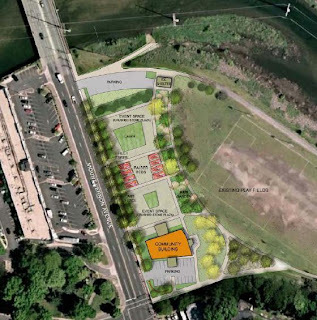 Indeed, the most intriguing presentation concerned the Four Mile Run Park (4MR) expansion. An informal group of small-firm architects from the area, referring to themselves collectively as "Architects Anonymous," used some of their 'free' time develop a breathtaking vision for 4MR. While this deserves a separate posting that will follow, we'll provide a preview. The architects envision inexpensively re-purposing the old Duron building at 4109 Mount Vernon Avenue into the focal point of a series of 'outdoor rooms' for community use. The building itself would be open-air and primarily for daytime, fair weather use unless significant funds become available in the future (the costly HVAC system needs replacement for indoor uses). Their vision, based on the 4MR Restoration Master Plan, got nearly everyone in attendance excited. One attendee said that in her 30 years living in the Arlandria area, this was one of the most exciting projects she's ever seen presented. But the plan was not without its detractors. Tenants and Workers United (TWU) representative Elsa Rivera suggested that the Duron building be re-purposed for a health clinic, a proposal that would require costly renovations, including the aforementioned HVAC system. Open Space Coordinator Laura Durham said she believes they are legally obligated to maintain it as a public park amenity since it was acquired through open space funds and is zoned as parkland. Some suggested they could hold vaccination clinics or the like a few times per year in the space. The engineering phase of the pilot project (between Mount Vernon Avenue & Route 1) is at 30% completion. NVRC plans to have engineering phase completed this summer. The funding for the actual work on the pilot project is confirmed and construction is anticipated to commence next year. The design competition for the Commonwealth Avenue-Eads Street pedestrian bridge has received 160 entries from around the world. Judges are narrowing entries down to the top 3 to present to the public in the near future. The most contentious portion of the meeting came during the open discussion session. This session brought Jimmy Matthews above comments about re-evaluating the vision for Arlandria holistically. TWU representative Jon Liss responded to this and other positive comments by saying there are "5,000-7,000" people in the Arlandria community that are not represented at the meeting. He said as soon as developers can figure out how to preserve "2,000-3,000 working poor households", he would be on-board. His comments could only be theatrics as there are fewer than 3,000 households in all of Arlandria (2000 Census shows a total of 6,000 households for the entire zip code, which includes numerous neighborhoods besides Arlandria.). Furthermore, TWU, a representative of the working poor, had multiple representatives in attendance. His comments brought sharp criticism from several attendees, including property owners. One attendee said that Mr. Liss had been acting as an obstructionist for years, resisting projects that would provide opportunities for many area residents. At one point during the meeting, Alexandria Bike-Pedestrian Planner Yon Lambert gave a short presentation on the West Glebe Road/Reed Avenue/Mount Vernon Avenue intersections. While the plans include only minor changes from those presented in September, the cost for completing both intersections has increased by about $100K, and the schedule for completion has been pushed back some, as well. The project will take at least another 9 months, AFTER approval (original schedule estimate put completion in summer 2010). One piece of good news, however: Arlandria actually has $700K in CIP for streetscape improvements to work with instead of just $500K. Neighborhood Planning Director Kathleen Beeton said there was an additional $200K that was allocated but not used. The only substantial or noticeable change to the design from September is that the cross-walk at Reed Avenue has been moved to the north side of the intersection. Engineering work continues. 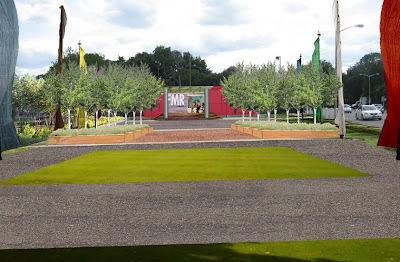 Park planning meetings will start very soon, and the next Arlandria meeting will be a developer forum in April to try and establish what the City can do to encourage developer interest. The next full AG meeting will be in June, but there will likely be other related meetings between now and then. Keep checking in with us for more info. Great coverage on these planning meetings. And good for Jimmy Matthews stepping up to take a lead. He - and the Birchmere - are a huge asset to this area. Nice seeing you at Misha's today. My husband and I just moved our family to this neighborhood this summer because of the wonderful socio-economic and cultural divirsity Chirilagua has to offer. I hope that those on the planning team continue to keep this in mind. The last thing northern Virginia needs is another wealthy generic development. The headline reads "Arlandria Residents Embrace Change"; I don't think everyone who lives in Arlandria would agree. Gentrification might be a welcome sight to home and business owners in this neighborhood but what will that do to the vibrant Latino community? Many of them are renting apartments and houses and if the real estate value of this area goes up they will certainly be forced out. My wife and I live in this neighborhood now and are in the process of buying a house here so our children will grow up in a diverse area and will get a taste of the real world. We have genuine relationships with our neighbors and they are actual people who have value despite what other people might think. Has the planning team thought about strengthening the education and stability of the current inhabitants of this community instead of bringing in new business and more people? We must include our other neighbors in these decisions and not just the wealthy landowners who want to see an increase on their investment. Three of the four large properties in discussion do not house anyone. They are commercial. The fourth is reaching the end of its usable life without significant renovation. Bringing businesses to the area brings jobs and opportunities for residents currently living in Arlandria. I also moved here 5+ years ago largely for the diversity. I grew up in the 'burbs but never liked the cookie-cutter, drive everywhere feel. I chose to live in Alexandria because of its diversity and walkability. One of the problems with Arlandria, though, is its lack of socio-economic diversity. Without some development and viable businesses, people lack opportunity. Did you know that Arlandria residents have one of the longest average commutes in the area? That's b/c people have to travel far from home to find a job. Also, the rental turnover in the community is extremely high. Neither fact is good for individuals or the the community at large. Do not assume that just because some people want a more walkable community with local choices and jobs that we all want to "gentrify" the community and force others out. Arlandria needs businesses that can stay afloat, jobs in the community, and probably more density to bring those things. Development doesn't just make the rich richer; with proper planning, it brings benefits to the community and sustainability to our local economy that nothing else could. A developer will not build if they won't make a profit, and then we lose all the benefits that they can bring. That said, we need to be careful not to give our community away to the highest bidder. Thank you Nick! It was wonderful to hear you say it in this way. I am very excited about the possibilities for our neighborhood. It is an active and vibrant place to live. I love being able to run to Mom's, Foodway, and 24 Express in one grocery shopping walk around the block. I am excited to hear the ideas the committee is bringing to the table to refresh and renew our park space, and I am excited to volunteer my time and to attend community meetings now that I know they are happening. I think any hesitation I feel stems from a deeply held passion that we protect, and in fact create more, affordable housing for our neighbors that work so hard for so little. The growth and change in Arlandria cannot come at their expense. It was comforting to hear your perspective, and I hope that great dialogue can continue. Potomac Yard Metro: "We Can See the Finish Line"